Homespun Stitchworks..... For the love of vintage: Hunting & Gathering ... for textile collage art.... part one. Hunting & Gathering ... for textile collage art.... part one. this is an exciting way to begin. Art is a personal thing, like a perfume or a book. We all look at things differently enjoy different things. The hunting and gathering of pieces of fabrics, linens and quilt bits is a very personal to each person, depending on what we like. Colours and textures differ from one person to another and we all see different things in nature, colour and textiles. Some of us like bold and beautiful and others of us like more subtle fabric designs ( which is probably my category) Although I am in love with reds as well. I also love to wear red especially in the colder months as it brings a warmth to me. Personally I see patterns and images in things. I can look at someones curtains and see a face or an animal and it is how I see the world really and of course for someone that loves to design and stitch I feel it is a great gift to have. One of my loves apart from vintage fairs is charity shops and flea markets to be able to rummage and search for a piece or two for my collection. I will take it home and wash it by hand gently and press it gently with a clean piece of cloth over it so the iron does not touch this precious find. With pieces of old quilts they tell a story about fabrics of the time. 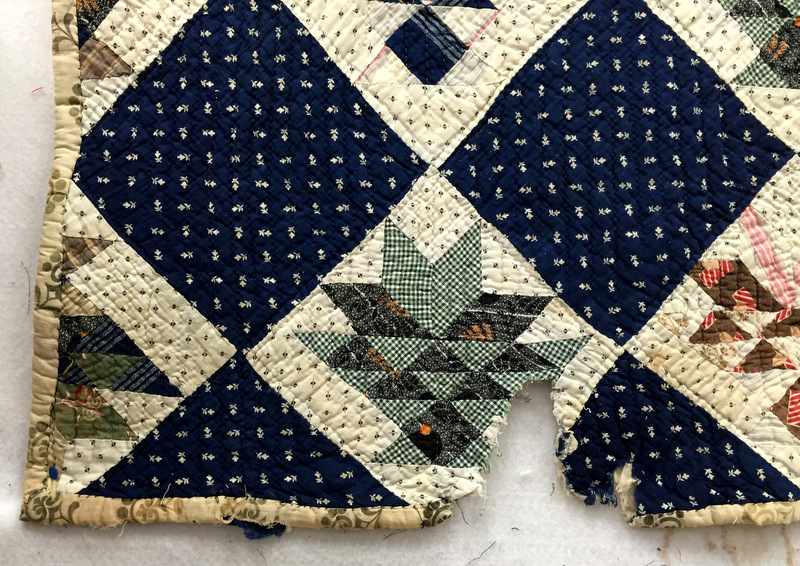 They were made out of necessity for warmth before central heating days and although later fabrics were bought for this purpose, very old pieces of quilts were made from old clothes and cloths and indeed some from feed sacks in America. You get a sense of history and wonder at was this little piece a dress or shirt or indeed was it someones Grandmothers cloth and passed down ... to us collectors and makers this all goes on in our heads and makes our finds even more precious, there is something about treasure hunting that is so pleasing and is the first part of our joy of making. Personally I prefer using old textiles to the new printed ones but some of you may prefer it the other way around and of course there is not right or wrong on this you can use what ever you like. Some of you may be lucky enough to have some passed down textiles, lace and buttons and you can incorporate these if you like and this is a great way to display them and give them a new lease of life and not let them be seen in a tin or a drawer somewhere. There beauty once more on show. I love to find old embroidery done by another, like a table cloth or napkins and these can then be cut and added to give another dimension, texture and history to a piece .. there is no limitations and you can create all sorts or wonderful things. bought from a very experienced and trusted lady who knows her fabric and dates. This piece is very very delicate and not really holding together so I am going to unpick and add it. I am reliably informed it is late 17th Century so that is what I am going to stitch on the finished piece when I get round to it. I have been asked about the care and storage of precious fabrics and the biggest predators of our precious hoards are sunlight and moths ..... these should be avoided at all costs. I like to wrap mine in bits of acid free tissue paper and write on it and put it in drawers or the clear clip boxes to stop the moths having a munch. I do wash things and there are some who would never do this, but I dislike anything that smells of damp or dirt so I hand wash large quilts in the Bath and rinse and rinse them. Then I do put them in a bucket to transport them to the washing machine for a little gentle spin. This way they are fresh for beds. I have some special gentle soap powder I bought in America for vintage fabrics and it smells of roses .... its a dream. Hand washing small bits of quilt or fabric is easy and I find it enjoyable. I have before bought a huge length of green paisley and it still has the clear protector on it so I did put it on a gentle wash in the machine to remove it and then gently dried it and pressed it. Old blankets are a good buy when you can get hold of them. When I started a few years ago I bought them from charity shops for about £1 as no one wanted them and I have a hoard of them. I am so pleased I did as they go for £20 upwards now ... If you get a cream coloured one you can dye it to what ever colour you like or indeed cut them up and dye different bits in different colours for your collection to use whenever its needed. I hope you have enjoyed this part today and have a wonderful weekend, tomorrow there is a fabulous tutorial that you really should not miss so please come back and have a watch. You know I once did a blog post on seeing faces in things. Lavender is a good moth repellent. I use my mother's pretty little lace handkerchiefs. Place a heap of lavender in the centre then pull up the edges and tie with a ribbon. I have just restored a beaded fringe on a victorian bag which has been hanging on a wall out of sunlight. The thread holding the beads just rotted. Everytime I replaced on bit another tassel fell off. One even fell off when my friend Zoe picked it up. Yes lavender is a great repellent and I have lavender around in my stitchery room, but I leave nothing to chance if it is secure and away from sunlight then I feel happy knowing I have done my best .... my treasure is precious and with my hoard I dread to think about price .. I have seen that you have restored that beautiful bag (on instagram) what a beauty too. When it is all secure what a gorgeous bag it will be again.